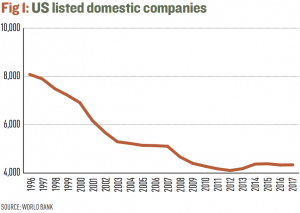 Over the past two decades, the number of listed companies has dropped on both sides of the Atlantic. Does this decline merely mirror the evolving nature of the global economy, or is it a sign of something more concerning? It would seem that there is nothing noteworthy about a company relinquishing the privilege of being listed on the stock market these days – such a move is all too common. Since 1996, the number of public companies in the US has almost halved (see Fig 1), with delistings exponentially increasing and IPOs also dropping. The average number of listed companies per one million US citizens has also halved since 1976, according to a recent report by the National Bureau of Economic Research, a US think tank. The study found that the US has roughly 5,000 fewer listed companies than would be expected for a country of its size, population, economic development and rule of law. 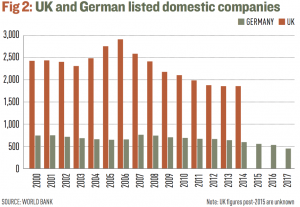 The picture is similar on the other side of the Atlantic: since 2000, the number of listed companies has dropped by 37 percent in Germany and by 23 percent in the UK (see Fig 2). The case of Interlink Electronics – a world leader in printed electronics with operations in Singapore, China, Hong Kong and Japan – corroborates this theory. The company’s delisting announcement noted: “The resulting reduction in operating expenses will allow us to invest greater amounts towards research and development and sales, which is a superior use of our limited resources.” The California-based firm had reregistered just three years ago, hoping to tap into capital markets to accelerate growth. However, things did not go as planned, as the firm’s leadership decided that “the benefits to the company and its stockholders of continued Nasdaq listing and SEC reporting did not justify the costs of maintaining that listing and continuing to publicly report”. Currently, the company asserts that it has “a strong balance sheet with no debt” and does not need to raise more capital to meet its targets. 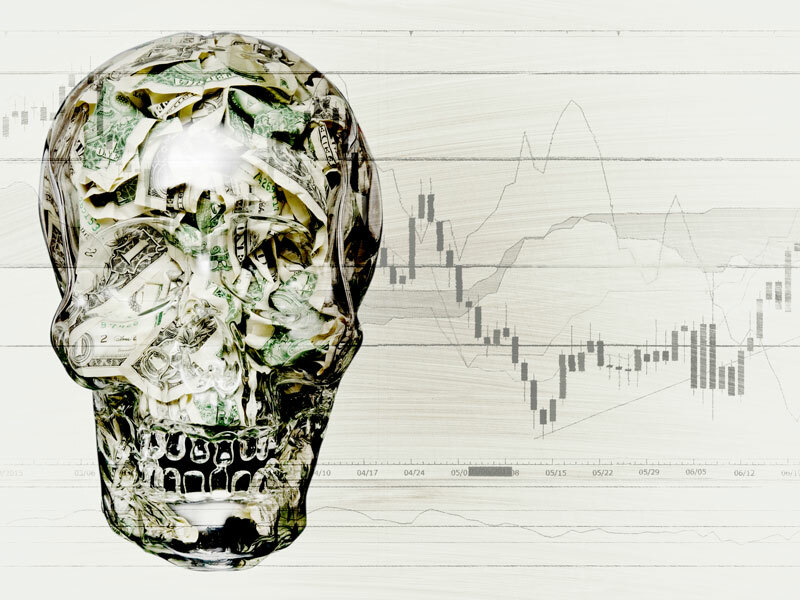 For some analysts, overregulation is the main culprit for the shrinking of stock markets. In the US, criticism focuses on the Sarbanes-Oxley Act, which was passed in 2002 as a response to the furore that followed the collapse of WorldCom and Enron due to illegal accounting practices. The law requires public companies to hire external auditors to scrutinise internal controls. Critics argue that this can be too onerous for smaller companies, costing them up to six times more for accounting compared with larger firms, according to the SEC. Others point to the JOBS Act, which increased the number of investors private companies are allowed to have before they need to report publicly. Recognising the problem, SEC Chairman Jay Clayton has announced the commission’s intention to provide smaller, fast-growing companies with incentives to list. One of the proposals under consideration is the possibility of allowing these companies to hold informal talks with investors before announcing a listing so that they can test the waters for an IPO. Smaller stock markets can have dire consequences for investors, many experts warn. Kara Stein, an SEC commissioner until January 2019, has repeatedly highlighted the importance of transparency in financial markets. Private companies are required to disclose a limited amount of data compared with public ones, although public information is necessary for investors and companies to make decisions. As Stein put it in an interview, the oversized growth of private markets at the expense of public ones could create “a deterioration in price discovery”. Less transparency also increases the risk of investors taking a major hit in the case of a crisis, given that investor protections in the private market are weaker. Some experts go as far as linking the decline of listings with the rise of inequality and populism on both sides of the Atlantic. In an influential paper, Swedish economists Alexander Ljungqvist, Joacim Tåg and Lars Persson claimed that delistings can reduce citizens’ exposure to corporate profits and undermine support for business-friendly and free trade policies. The authors warned that “a shrinking stock market can trigger a chain of events that leads to long-term reductions in aggregate investment, productivity and employment”. By being excluded from capital markets, the average voter cannot reap the benefits of globalisation through increased share prices. Many analysts are worried that the slow shrinking of stock markets reflects a bigger crisis: the concentration of corporate earnings in a small number of companies. Over the past few years, the earnings of the top 200 US firms have exceeded or approximated those of all other public firms combined. During the same period of time, US public firms have shown a preference for returning equity to investors rather than raising new capital, exacerbating fears that stock markets are becoming a mechanism for rewarding shareholders.